Superior dual ram compression technology for producing the industry’s densest scrap pucks. 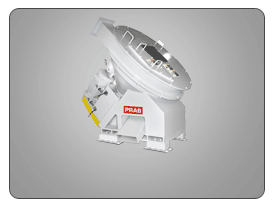 PRAB’s Dualpak briquetting machines increase the value of metal chips, loose turnings and swarf by compressing them into near solid, dry briquettes for scrap metal recycling to send to the recycler or feed to furnace. 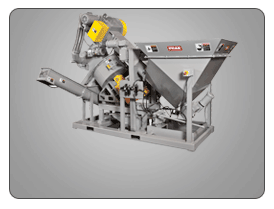 Unlike competing briquetting machines, the Dualpak uses two opposing hydraulic cylinders. These cylinders press metal equally from both sides, creating the driest, most compact scrap pucks on the market. PRAB Dualpak Briquetters mitigate EPA risk by providing dry metal scrap and separating fluid for recycle or reuse. The Dualpak briquetter improves housekeeping. Pucks are easy to re-melt, transport and store. PRAB systems have the industry’s leading reputation as being dependable low-maintenance equipment with long service lives. The Dualpak Briquetter provides easy access to dies minimizing downtime. Briquettes- or scrap pucks, are easy to re-melt, transport or store giving you more floor space, optimized container fill, cleaner shop and more value from the scrap dealer until a better price is available for scrap metal recycling. You’ll also maintain a cleaner, more environmentally friendly shop with a briquette press. Dualpak™ briquetting machines are available in nine models to handle different capacities and a variety of machining metals, including aluminum, steel, cast iron, copper, brass, titanium, magnesium and more. The Dualpak™ briquette press is available in nine models to handle different capacities and a variety of machining metals, including aluminum, steel, cast iron, copper, brass, titanium, magnesium and more. Dualpak™ briquetter scrap removal systems are available in nine models to handle capacities up to 5,000 LBS lb/hr (2268 kg/hr) and a variety of machining metals, including aluminum, steel, cast iron, copper, brass, titanium, magnesium and more. See charts below for full specifications. *Compression times vary depending on the specific material being compressed. *Higher face pressures are available. 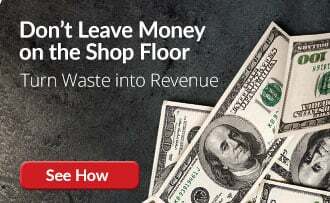 Briquetters reduce machining scrap moisture content and simplify handling, allowing shops to get more money from the scrap dealer and to save on coolant. The PRAB Dualpak™ Briquetter uses superior dual-ram compression technology for producing the industry’s densest metal scrap pucks. Pucks are easy to re-melt, transport or store which frees up more floor space. They also optimize container fill and create a cleaner shop. The PRAB Dualpak Briquetter handles a variety of scrap including aluminum, steel, cast iron, copper, brass, titanium, magnesium and more. 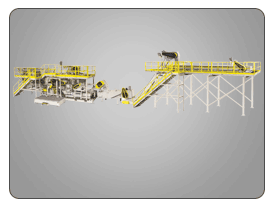 In July 2014 PRAB, Inc. acquired the PuckMaster assets in order to bring together the best in briquetting technology and material handling under one brand. PRAB supports all existing PuckMaster installations worldwide. 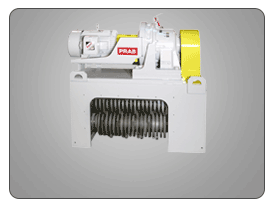 Customers with PuckMaster briquetting machines that need service should contact the PRAB customer service department. For 24/7 emergency support for PuckMaster briquetting machines, please call the toll-free number listed above and follow the voice prompt to contact a technical service technician.